How can cities plan for electric vehicles? Unlike most of my classmates in Energy Technology and Policy this semester – most of whom are from the Engineering, Public Affairs or Business schools – I am fortunate to have the opportunity to join this course coming from the School of Architecture as a Community & Regional Planning student. With over half of the world’s population now living in urbanized areas, I believe it is important to have a good understanding of the ways in which cities consume energy and how we can plan for new energy technologies. In order to spur demand for EVs in the short term, forward-thinking cities have begun to develop public charging station networks. The following three case studies outline some of citing criteria that cities are using to plan for their public charging networks based on their unique land use patterns, demographic makeup and built environment. Cities that promote the early adoption of EVs stand to benefit by securing federal funds for infrastructure projects, building a “green” reputation, and attracting investment from EV automakers (6). Whatever the motivation may be, it is becoming increasingly clear that cities will play a role in the electric vehicle revolution. It is crucial for those of us in the planning field to develop an understanding of how energy technology and policy will affect the cities we serve, and what role the public sector should play in planning for the changes taking place in the energy sector. Currently, the Chevy Volt is undergoing cold weather testing in Kapuskasing Canada and is on track for the Nov 1, 2010 production date. The earliest consumers could take one home is estimated to be late November or early December. The release of this car is a very big deal for the automobile industry, consumers, and policy makers. Aside from the luxurious Tesla roadster, the Chevy Volt will be the first mass-produced vehicle that uses an electric motor for its propulsion system. However, the Chevy Volt is still labeled as a hybrid-car by the Society of Automotive Engineers because it uses two energy storage systems to provide propulsion power. GM claims that this plug-in-car can travel an average of 40 miles without ever using a drop of gas in the car’s 1.4 liter 4-cyl flex-fuel (unleaded gasoline or E-85) engine. Unlike current hybrid vehicles, the internal combustion (IC) engine is only used when the battery is low. For the first time in the automobile industry the IC engine solely drives an electric generator that charges the batteries and powers the electric motor versus mechanically driving the wheels. Why are the car companies switching from gas to hybrid-vehicles and now to electrically propelled vehicles? Improving fuel economy, improving emissions, and displacing dependency on petroleum are goals GM and other car companies are working to achieve. 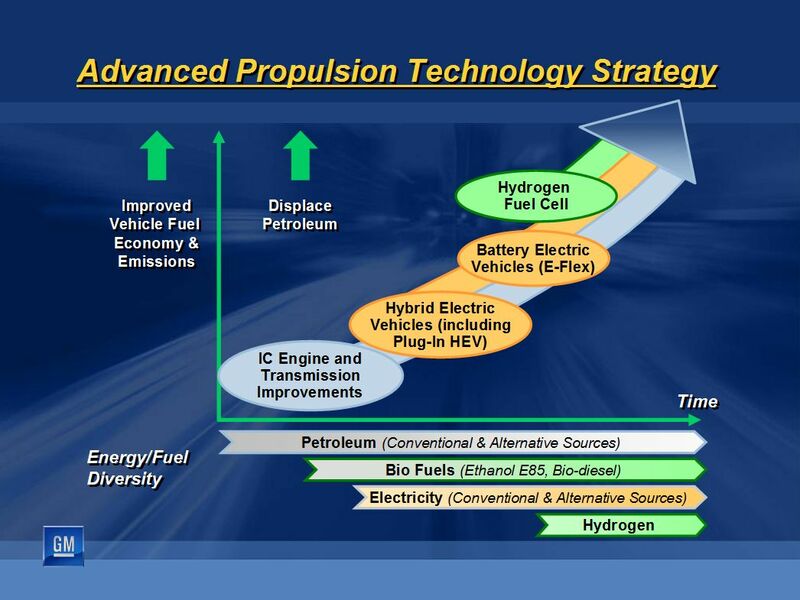 Above is a slide from a presentation by GMPT that describes the companies Advanced Propulsion Technology Strategy. The release of the Chevy Volt will represent a big shift up GM’s strategy curve. During the first 40 miles of operation the car will produce zero emissions because the IC engine will not be operating. Additionally, the possibility of completely displacing petroleum in the first 40 miles of operation exists depending on how the electricity the consumer used to charge the car was generated. The next big question in everyone’s head should be cost. GM has not revealed a price but says it will be around $40,000. What would be the cost if you only drive the car less the 40 miles each day and charge it up overnight? The average U.S. electricity cost is 11 cents per kWh and the electricity needed to drive 1 mile would be 3 cents. This sounds very attractive but a price tag that is roughly twice that of the Toyota Prius does not make the Volt a good economic decision unless gas prices skyrocket. However, power companies and governments will be offering incentives to people who purchase these plug-in-vehicles. For example, buying this car would allow you to claim a $7,500 tax credit in the United States. Additionally, Canada’s government has already committed to support GM and offset the cost of the car by purchasing 500 Volts which will be used as government-use vehicles and by giving Canadians rebates up to $10,000. Finally, there is a lot of controversy of how to rate the fuel economy of this vehicle. GM claims the Volt has a 230 mpg rating in the city. However, this is very deceiving and will surely cause the EPA some headaches when they decide how to rate this car. Depending on how the accounting is done the fuel economy could be 1000 mpg. However here are two facts that you can use to decide what the miles per gallon rating is. On average after a full charge you will be able to drive 40 miles without the IC engine kicking in. After the IC engine kicks in you can expect 48 mpg. For example, if you drive 50 miles you will use approximately 0.2 gallons of gasoline, thus giving you a rating of 250 miles per gallon of gasoline. In other words the fuel economy will depend on the range of your drive and will decrease towards 48 mpg as the range you travel without plugging in increases.